Professional development directors and managers in the public sector strive to provide their workforces with training so they acquire new skill sets and amplify existing ones. However, there is an inherent tension between available time that employees may dedicate to taking courses and their workloads – particularly when on-the-job multi-tasking is considered a matter of course. Relatedly, researchers in the field have suggested that employees prefer learning frameworks that are accessible through technology, readily actionable and provide opportunities for relational interactivity. The microlearning guiding premise and practice of “just in time learning” may well address accessibility and immediate application Microlearning: Strategy, Examples, Applications & More. Additionally, public sector training professionals may consider and adapt “the concepts of Bandura’s Social Learning Theory” to address employee engagement “in a social media context” Social Learning Theory in the Age of Social Media: Implications for Educational Practitioners. Through a combined approach that utilizes learning management systems, mobile devices and social media channels administrators in the professional development milieu may be well positioned to deliver a balanced learning experience that is markedly employee centered. Microlearning is “a teaching style that involves short bursts of highly engaging and interactive information, delivered to the learner at his or her request. The learner is in full control of his or her education, and decides what, when and how much he or she is learning.” To design microlearning training curricula, public sector learning and development practitioners may first consider surveying their organizational units to discern employee skill gaps. Practitioners may then analyze the collected data to distinguish micro units from broad, generalized skill sets. As one example, collected data may reveal customer service as a desired organizational unit skill set. Customer service may be segmented into micro skills such as: telephone etiquette and timely follow-up. 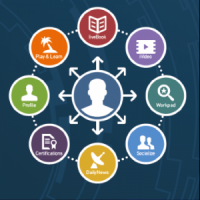 Training administrators and content developers may then originate microlearning experiences based upon micro-skill segments. To address “just in time” employee accessibility, administrators can apply learning management system technology to “house” short-duration, progressive learning units. Using the example of telephone etiquette, administrators may develop three ten-minute units of concept and practice titled: professional telephone introductions; asking clients key questions, phrases that enhance client confidence. These types of micro units may be developed so that employees can avail themselves of just-in-time learning by taking one or more short-duration courses, a la carte. Alternately, employees may pursue the more “traditional” learning path of enrolling in one or more longer-duration courses or programs (typically towards certificate designations). Professional development administrators may structure microlearning programs so that employees may optionally “build” their own learning tracks based on current or advancement job requirements. Administrators may also continue to design and maintain predetermined programs to enhance employee selection efficacy. In both instances, employees’ microlearning experiences should, ideally, be tracked and credited as part of their overall professional development endeavors and achievements. “Bandura’s Social Learning Theory posits that people learn from one another, via observation, imitation, and modeling” Social Learning Theory. In addition to the microlearning accessibility model, public sector professional development administrators may consider ways to “interweave” the social characteristics of adult learning in what may otherwise be a siloed training framework comprised of lone employees. Professional education administrators may further design microlearning units so that they incorporate select elements of social media interactivity. Adapting the social technology features of real-time chat rooms, interactive simulations and blog posts can further enrich employees’ experiences with microlearning units in ways that mirror their other professional social media interactions. As one example, several employees may simultaneously access an online telephone etiquette micro course that also includes multiple participant, synchronous engagement activities. To begin a ten-minute telephone etiquette learning segment, participants may be prompted to post a brief introduction in a chat room environment. At the mid-point of such a session, learners may be further prompted to post questions or comments to each other, based on the lesson and/or their workplace experiences. Through the inclusion of these and other types of interactive communication modes, professional learning administrators may enhance just-in-time training with a learning community framework. To effectively implement micro and social learning concepts, public sector training administrators must first assess capacity from multiple perspectives: organization wide skills needs assessment, learning management system capacities, program cost structure and implementation timeframes. Ultimately, the multi-faceted elements of adapting a robust microlearning program must be aligned with overarching professional development mission and goals. Public sector professional development administrators may begin conceptualizing a microlearning approach for their agencies and departments with a holistic vision that considers anticipated organizational and employee outcomes through strategic planning.